It’s a proven fact that a hole or stain in paneling or wallpaper enlarges every time you look at it. Given a few weeks it will soon engulf the entire wall, and every time you look at that wall your eyes will immediately go to the gaping blemish. The solution is quite simple: take an hour or two one weekend soon and repair the paneling or wallpaper blemish. It’s actually quite easy. If your wallpaper has pulled away from the wall, you can repaste it in a matter of minutes. First, pull it back carefully to determine how much is actually loose. Repasting a larger portion now will spare you some smaller patches later. Apply a small amount of wallpaper paste under the pulled-back wallpaper. Use a 1-inch brush or a squeeze bottle. Lay the paper back into place and press it with a seam roller or rolling pin. If the wallpaper has a bulge or bubble, you can make a small slit and force glue into it, and then press the bulge carefully back into place. However, you may also be able to remove the bulge by placing an electric iron on it set for low heat. This will possibly melt the paste behind the paper and reattach it to the wall. To remove a bubble in newly pasted wallpaper, puncture the bubble with a straight pin and press the edges down toward the puncture to squeeze out excess paste. Wipe the spot clean with a damp sponge and press with a seam roller. It’ll be nice if the wallpaper installer has left excess portions of wallpaper in a dry place for use in patching. If not, you may be able to find a match at a wallpaper or paint shop, but don’t count on it; there are often many thousands of patterns produced over the years by even one manufacturer. If necessary, you may be able to remove a small section from inside a closet or other inconspicuous location for use in patching. Lay the patch over the location to be replaced, lining up designs. 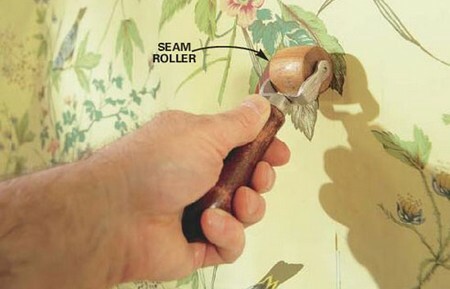 Then cut through both the patch and the old wallpaper with an artist’s knife or razor blade. Strip away the old piece, apply paste to the replacement, and install the new piece in the same spot. Sometimes the best solution is to find a picture the correct size and hang it over the bad spot. Before attempting to clean wallpaper, be sure that it is the type of wallpaper that can be washed. Some wallpapers have protective coatings that allow them to be washed by sponging with clean water. Sponge washable wallpaper with a mild detergent solution to remove dirt. You can clean nonwashable wallpaper with a special dough-like wallpaper cleaner purchased at hardware and building material retailers. When you rub it on the surface of the paper, it picks up the dirt. The cleaner exposes a new surface, and can be used until it has become completely saturated with dirt. Of course, first test it on some inconspicuous part of the wall to make sure that it won’t affect the coloring of the paper. You can also use an artist’s kneaded eraser available from an art shop. You can remove grease spots from wallpaper by mixing a paste of Fuller’s earth and carbon tetrachloride, or some noninflammable cleaning fluid. Apply this paste to the grease spot and allow it to dry; then brush off gently. Several applications may be required if the grease has been on the paper for a long time. You can apply varnish to preserve the appearance of the wallpaper. Varnish may stain the paper, however, so you should be careful about which type you buy and you should test it before application. There are also special wallpaper coatings available at larger hardware and building material retailers. 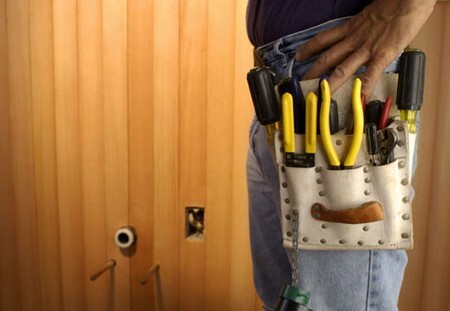 Depending on the type of wall paneling you have, repairs may be quite easy. The easiest repair is of small nicks and scratches to real wood paneling. In most cases, you can repair them by simply applying one of the many renewing wood oils available on the market. Simply apply the oil on an absorbent rag and smoothly spread it on the wood. Not only will it give the wood a sheen, but it will fill and color a majority of the scratches and nicks within the wood. For stubborn marks, there are coloring and patch sticks¡ªcalled fill sticks-available in dozens of colors and shades. Working like hard lipstick, these sticks actually fill the hole with a substance made of wood filler and coloring. Make sure that the color you use is identical to or very close to the paneling you are repairing. If in doubt, take a sample or ask the clerk. They are often less expensive than a second trip to the store so you may want to purchase two or more. Full repairs of paneling are more difficult. The hardest part is making it not look like a patch. Sometimes you can cut a patch at a natural line or design point that minimizes the cut. Other times you have to rely on oils and fill sticks to help you blend the patch. Cut the patch the same size as the portion you will remove, lift out the old piece, and replace it with the patch. Depending on the type of wood, you may want to restain or recolor the area to minimize the patch.